Photo of an unofficial collaboration of Vans and Hermes from The Vans 66 flickr album via Miss Moss. I couldn't help but re-post this photo from the always spot-on blog, Miss Moss; my head nearly exploded when I saw it. It's not an official collaboration, just a custom project made from vintage Hermes scarves. Insane. Oh, and please check out this guest post I did for A Cup of Jo on how to pack smart with tomboy style. HI Lizzie! I love the guest post on packing! Especially the bandana, I think I have a similar one on right now! Okay, so ... wow. I, too, am glad these are not available for purchase. Because I'd have to construct a shrine. these slip-ons are freaking amazing and i loved your guest post too! i've been meaning to pick up that madewell shirt for a while now... even more motivation! My 90 year old mother was just asking me if I didn't want her old Hermes scarves! And I thought I wouldn't be able to wear them! just found you through cup of jo. omg. love this blog. i've always been a tomboy and now here you are celebrating them! yay. I loved your post on Cup of Jo today. You really inspire me to be true to myself and forget about trying to be something I'm not. So now I'm obsessed with these... I need to take a deep breath. So awesome. Before you know there will be a waiting list longer then the Birkin for these babies! Love. These are beautiful. They really are. So I hate to be the party pooper here, but aren't they also pretty offensive? Lizzie, I have a friend who is Navajo, and we've spoken about these kinds of things before. I do believe he would consider this offensive... but it can be hard to know where to draw the line. 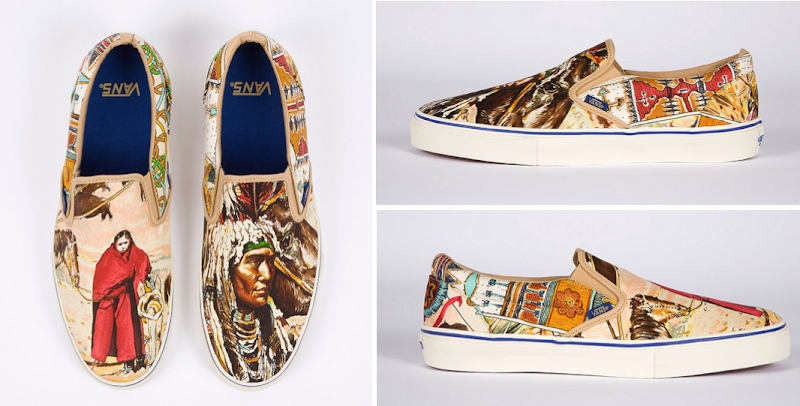 This blog post and its comments provide an interesting discussion on Native American inspired fashion: http://thesocietypages.org/socimages/2010/04/13/american-indian-is-in/ I hesitated to say anything in the first place, because I'm sure that the designers behind this shoe as well as you and anyone else who have blogged about it mean no disrespect. But I do feel that the subject should be brought up.